It seems hard to believe that it’s that time already, but Supertonic wish to joyfully announce their final concert of 2018, In the Key of Christmas. This choral concert will be held at 7pm on Tuesday 4th December at Wesley Church, Wellington. While things start to get a little frantic in the lead up to the festive season, with end-of-year parties, gift shopping and travel planning aplenty, Supertonic hope to offer their audience a moment of calm. Take a moment to soak up the sounds of Christmastime with an evening of choral melodies to inspire merry memories of years gone by. The programme includes classic and contemporary works, including Ola Gjeilo’s modern arrangement of the dearly-treasured Christmas carol Away in a Manger, the delightful Somewhere in my Memory composed by John Williams for the classic Christmas film Home Alone, and Handel’s stirring Hallelujah Chorus. 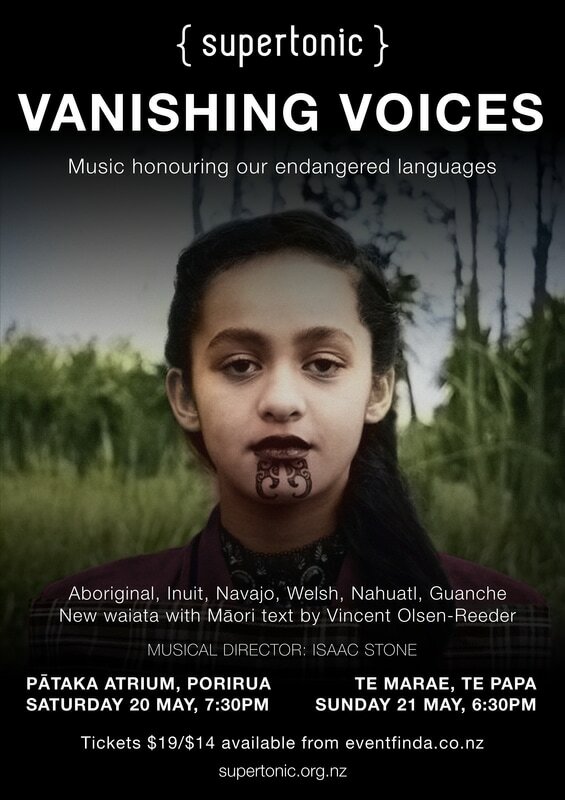 Sure to be a highlight is Pō Marie, a kiwi setting of Silent Night arranged by Terence Maskell, with lyrics in te reo Māori and in English. Pieces by Mendelssohn, Holst and Tchaikovsky will also feature. There will be a number of small ensemble and solo performances, together with the sounds of 56-voice-strong Supertonic that audiences have grown to love. This concert will be conducted by Hazel Fenemor. A member of Supertonic choir since 2015, Hazel is an exceptionally talented musician. Previously music director of Wellington Youth Choir, Hazel is excited to return to directing for this concert. So why not treat yourself to an evening of delightful music and festive cheer? Tickets are available at www.supertonic.org.nz. Supertonic is a Wellington-based choir amed at singers in their 20s and 30s that seeks to take choral music to different places and new heights. Supertonic is well known for its innovative and no-compromise concerts, from those exploring ways to amplify voices that are seldom heard, to its all-out rock extravaganzas that turn the concept of a choral concert on its head. Supertonic is pleased to present our first concert of the year - Shakespeare's Sister - to be performed at Pipitea Marae, 6:30pm, Sunday 20 May. Shakespeare’s Sister takes inspiration from Virginia Woolf’s A Room of One’s Own. Woolf argues that the disadvantages faced by women throughout history have fuelled the assumption that they are inferior writers or subjects. She imagines what kind of ‘thwarted and hindered’ life a talented sister of Shakespeare might have lived. We present this programme of works by women in honour and celebration of those who created art in the shadows of their male counterparts. Hosted by Clarissa Dunn, the audience will hear not only the music of underappreciated composers, but also hear their stories, and what held them back from their dreams. Clara Schumann’s talent was controlled and micromanaged by a domineering father, while Amy Beach’s marriage contract stipulated that she was to end her career as a pianist. Fanny Hensel (née Mendelssohn) was overshadowed by her brother Felix, despite her own extraordinary creative abilities. Alma Mahler, Francesca Caccini and Lili Boulanger are also among the forgotten prodigies we will feature in this concert. This performance will also celebrate New Zealand music. Dorothy Buchanan’s Five Vignettes of Women is inspired by prominent women writers, including Virginia Woolf and Katherine Mansfield. Buchanan is renowned as one of Aotearoa’s most prolific composers, and was the first woman to join the Musicians’ Union. The centrepiece for Shakespeare’s Sister is a commission from one of New Zealand’s future star composers, Rosa Elliott, who was approached by music director Isaac Stone because of her “incredible way with haunting melodies, matched perfectly with choral colours”. Elliott has masterfully set three poems by Mary Ann Evans, who used the pseudonym George Eliot to escape the stereotypes of women writers. Supertonic is a 56-strong Wellington based choir aimed at singers in their 20s and 30s that seeks to take choral music to different places and new heights. Supertonic is known for its innovative and no-compromise concerts, exploring topics from endangered and extinct languages to works written by those suffering imprisonment. With Shakespeare’s Sister, we wish to offer hope for current and future generations of women who will create art in their own image and with their own names. Note: This concert is now sold out. If you are still interested in attending please email info@supertonic.org.nz and we will let you know if a ticket becomes available. Dedicated to the muses of music, Love The Arts is Supertonic’s final concert series of 2017, completing a remarkable year of sold out concerts that defied the normal boundaries of choral music. In keeping with the concert theme, Supertonic will be sharing its love of the arts by donating the proceeds from the concerts to local cultural organisations: Hamilton’s The Meteor Theatre, Feilding’s Coach House Museum and Wellington’s New Zealand Portrait Gallery. The concerts will feature four sets of music, each showcasing choral music inspired by a different art form. ‘Write’ will include musical settings of some of the world’s most celebrated poems, including Finnish composer Rautavaara’s mystical interpretation of four poems by the master Spanish writer García Lorca, and Vaughan Williams’ beautiful Rest, with words by Christina Rossetti. With ‘Dance’, the choir will demonstrate its classical and romantic chops with some music from Schumann, Elgar and the audience favourite Polovtsian Dances by Borodin. In a moment of introspection, ‘Sing’ will delve into the very essence of music itself. Perhaps this is showcased best by The Awakening, Joseph M. Martin’s epic rhapsody that begins by imagining a world without music and develops into a stirring anthem pleading to “let music live”. Finishing each concert will be ‘Paint’, a set including Don McLean’s poignant Vincent, Sunday in the Park with George by Stephen Sondheim, and a special take on the late David Bowie’s Andy Warhol. Now in only its fourth year, Supertonic (under the direction of Isaac Stone) has cemented its place amongst Wellington’s thriving musical community, with a reputation for combining accessible, provocative and enjoyable concerts with a rich, vibrant and immersive sound. The 56 strong choir of young professionals and recent graduates is built on the ethos that strong friendships, trust in one another, and building enduring relationships is what creates special music for both its singers and its audiences. 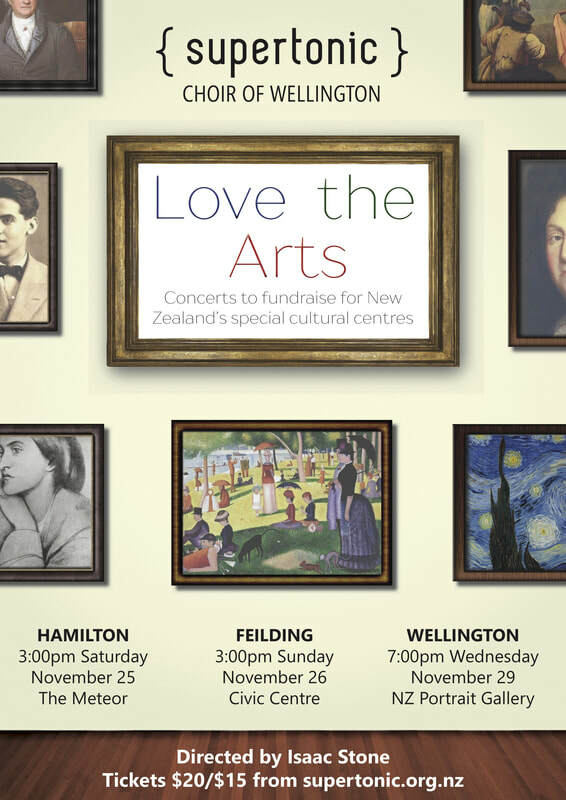 Love the Arts will be toured across the North Island, with concerts in Hamilton (3pm, November 25 at the The Meteor), Feilding (3pm, November 26 at the Civic Centre) and Wellington (7pm, November 29 at the New Zealand Portrait Gallery). Tickets are $20/$15 and will be on sale from Wednesday 25 October via supertonic.org.nz. Let the songs begin. Let the music play. Get ready for Supertonic’s next gig Thunderbolt and Lightning, an epic tribute concert set to rock Queen fans and choir buffs alike at the Hunter Lounge this September. This choral spectacular has it all - the choir’s powerful sound from its 56 singers, a full rock band, exciting solos and quartets, and heart-stopping takes on your favourite Queen anthems. Thunderbolt and Lightning aims to be as diverse as Queen’s extensive catalogue - from the light pop shuffle of You’re My Best Friend to the epic pastiche of musical styles in Bohemian Rhapsody. A quartet of our talented operatic singers will tackle Freddie Mercury and Montserrat Caballe’s collaboration in Barcelona, written for the 1992 Olympics, while The Prophet’s Song from their progressive album A Night At The Opera features the choir imitating their looped sample recording techniques in this mammoth and lesser known track. You’ll hear the full force of our rich sound in the unforgettable harmonies of Somebody to Love, and in Who Wants To Live Forever the choir starts with a single note that flows and grows into a spine-tingling 24-part chorus. Supertonic (and its director, Isaac Stone) aims to take choral music to new places and new heights with its innovative and no-compromises concerts, and this one promises to be the most exhilarating yet. We’re gonna make a Supertonic fan out of you! Update: This concert is now sold out, and the waitlist for tickets is also full. If you have purchased a ticket that you are no longer able to use, please email info@supertonic.org.nz. We can then refund your ticket and pass it on to someone on the existing waitlist. Supertonic and The Wellington Footlights Society are proud to present Showmance, a concert celebrating friendship, community, and musical theatre. A first-time collaboration of the choir and musical theatre society, these two groups will bring their own strengths to two performances at Te Whaea Theatre on December 10. Audiences of Showmance can expect to be wowed by old favourites and newer show tunes alike, with the excitement of 80 performers giving it their all. The two groups are excited to bring you this special, two performance only show under the musical direction of Supertonic director Isaac Stone, and Footlights’ Michael Stebbings (Legally Blonde) in a concert showcasing the strength of musical collaboration, feel-good vocal power and theatrical spectacle. See you there! 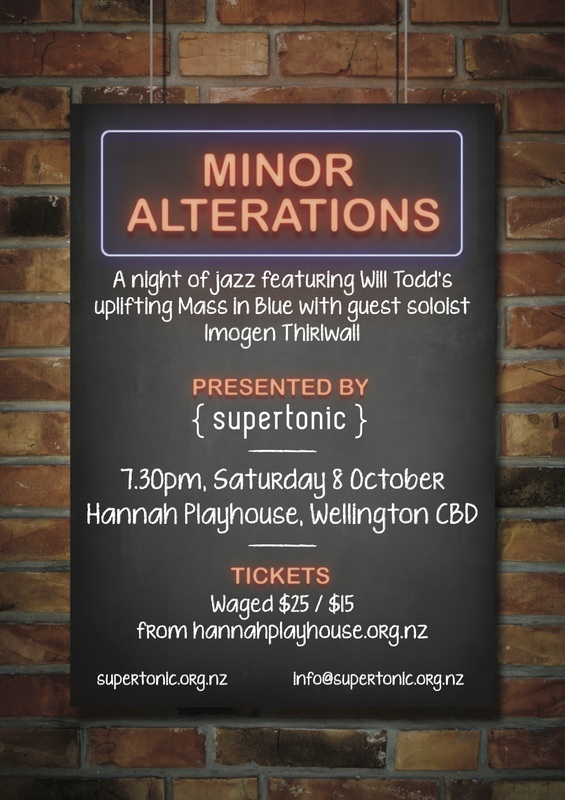 ​Supertonic is proud to present "Minor Alterations", its first entirely jazz based concert, at Hannah Playhouse on Saturday October 8. Far from the same jazz choir numbers you've all heard before, this one-night-only show pulls the power of jazz into songs from totally different origins, complete with a three-piece combo and the effervescent vocals of soprano Imogen Thirlwall. Will Todd's Mass in Blue twists the standard Latin Mass into a punchy uplifting jazz ride, delving into scorching blues, up-tempo beats and swinging into a jazz waltz. This enormously popular music doesn't hold anything back - the soaring voices of the 56-strong choir interplays with the dramatic soprano soloist, supported by the rich blues and driving groove of the band. Paired with this is a series of well-known songs reinvigorated through the jazz idiom. My Favourite Things becomes the story of a modern day jazz singer, balancing the demands of the everyday with a rich musical life; Scarborough Fair takes the popular Simon and Garfunkel melody down a haunting path - a treat for fans of folk and jazz alike; Queen's Crazy Little Thing Called Love remains familiar and toe-tappingly catchy. Supertonic's singers pride themselves on presenting appealing, varied and high quality choral music to Wellington and beyond. Despite being less than three years old, the choir has already made a name for itself as a "new phenomenon on the Wellington choral scene". Equally at home with traditional classical music such as Vaughan Williams' Mass in G and Britten’s Rejoice in the Lamb, Supertonic enjoys presenting more boundary-pushing programmes such as Fighting in the Dance Hall, a pairing of arrangements from Fleetwood Mac’s Rumours and David Bowie’s Hunky Dory. The choir's director is Isaac Stone, a teacher of classroom music and leader of the choral programme at Tawa College in Wellington. Isaac places a premium on making choral music that is accessible but challenging - creating concerts that inspire both new and experienced singers, as well as capturing and captivating a new audience for choral music in Wellington. Tickets are Waged $25 / Unwaged $15 and can be purchased from hannahplayhouse.org.nz. Supertonic is delighted to announce its 2016 tour to Hawke’s Bay, with an intimate concert in the beautiful surroundings and acoustics of Church Road Winery's cellar on Saturday September 10, and a highly anticipated performance at the iconic Central Hawke’s Bay Municipal Theatre on Sunday September 11. 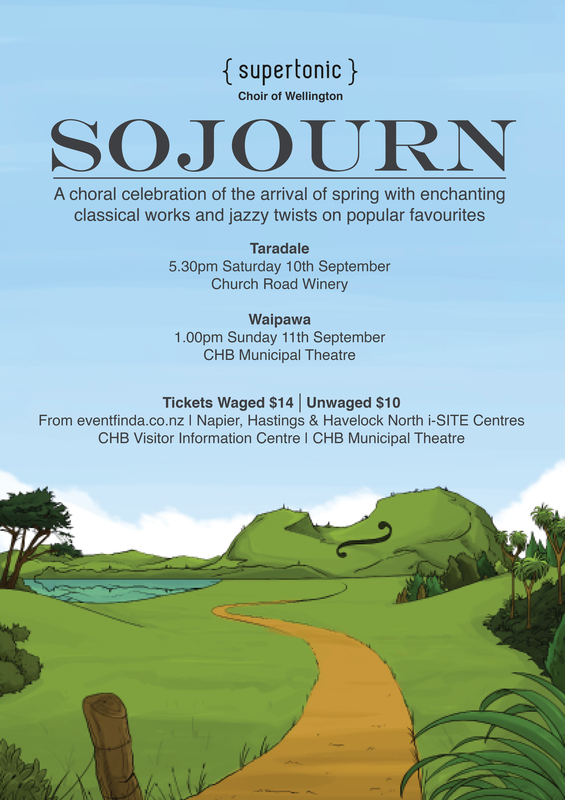 Comprising of 56 Wellington singers in their 20s and 30s, the avid young choir will present Sojourn, a programme of enchanting classical works and popular songs reinvigorated through the jazz idiom. The programme embodies the changing of the seasons and the rejuvenation and vitality of spring through a variety of genres. Works by English composer Gustav Holst will feature, including his Six Folk Songs; quintessential traditional pieces examining themes of love, loss and adventure. In contrast, the choir will perform popular classics such as Scarborough Fair and My Favourite Things, all refreshed by a jazz twist. This complementary pairing highlights the communicative power of music, capturing and conveying emotion across the decades. Supertonic's musical director Isaac Stone has led the choir since its inception in 2014. A teacher of classroom music and leader of the choral programme at Tawa College in Wellington, he places a premium on making choral music enjoyable and accessible to singers and audiences alike. 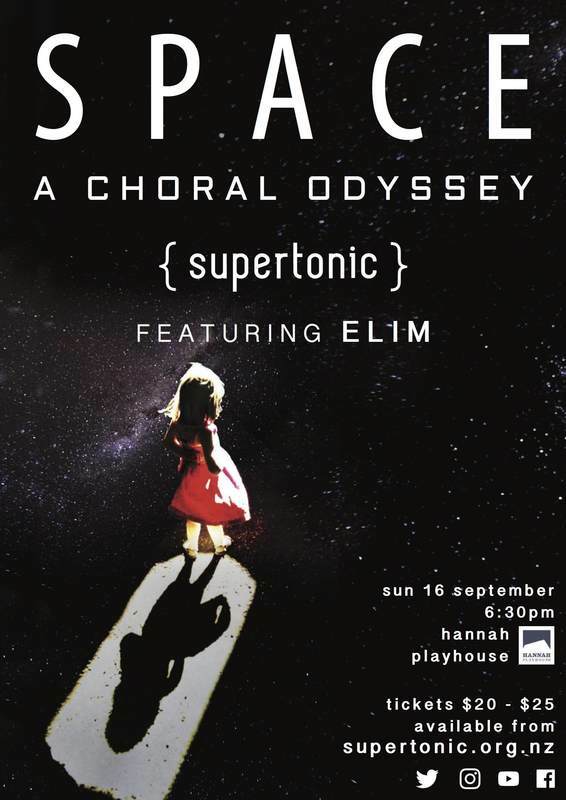 Over the last three years Supertonic has performed both traditional classical music such as Vaughan Williams' Mass in G and Britten’s Rejoice in the Lamb, as well as presenting more boundary-pushing programmes such as Fighting in the Dance Hall, which paired Fleetwood Mac’s Rumours with David Bowie’s Hunky Dory in a choral rock concert extravaganza. The choir’s combination of technical skill and passion for the music they perform has Supertonic noted by critics as a new phenomenon in the Wellington choral scene.